All ConSet A/S development and production comply as a minimum with the prevailing environmental legislation and demands from the various product areas. Based on our strong awareness of the environment we always aim at reducing the strain on both the internal and the external environment for the benefit for all parties. Read about environmental handling in ConSet A/S: Environmental Policy.pdf. We avoid most dangerous substances in our products. So you will not find any formaldehyde, lead, mercury, cadmium, hexavalent chrome, polybrome biphenyles (PBB) or polybrome diphenylethere (PBB) in a ConSet product. ConSet primarily uses wood from capacious forests (FSC). The main wood production is placed in Germany, where we comply with the most severe German E1-norm for formaldehyde limits. The new directive for reducing dangerous substances in electronic products and components is called RoHS. ConSet´s supplyers of electronic components (transformers, operating panels etc.) all comply with this directive. In Denmark ConSet currently cooperates with BST and The Labour supervision to prevent injuries and accidents. At our supplyers we comply with the prevailing laws of their country and visit them several times every year. More of our supplyers are ISO 14000 certified. 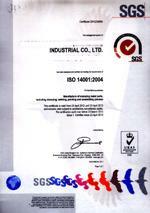 This certification of the factories ensures a broad safety concerning the environmental conditions. ConSet always recommends that you disassemble the product before disposal. Electronic components are covered by the Weee-directive stating the rules for disposal of electronic waste. All parts in a ConSet product covered by the Weee-directive are marked with the symbol on the right.